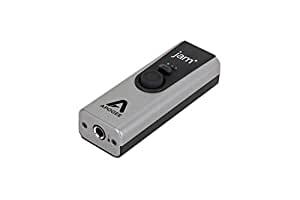 Apogee Jam+ is a professional, USB instrument input and headphone output. Jam+ connects your electric guitar, bass, keyboard or any acoustic instrument with a pickup directly to your iOS device or computer. With an adapter (sold separately) you can also connect a dynamic microphone. The simplicity and portability of Jam+ make it ideal for capturing your best take anywhere you go. The ease of use and sound quality make Jam+ a must-have for beginners and pros.